Flamethrowers are weapons that shoot flaming liquid at enemy positions. They are typically short in range, rapidly exhaust their fuel, and are hazardous to employ; but they proved very effective at reducing fortifications. They were little used by the Japanese, who rarely found themselves in a tactical situation requiring the reduction of Allied fortifications, but they found extensive use in the hands of Allied forces in the Pacific theater, beginning particularly with the New Georgia campaign. 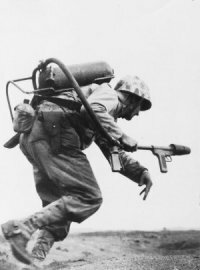 Flamethrowers originally took the form of a man-portable weapon. The operator carried two or three cylinders on his back. One contained an inert propellant gas such as nitrogen and the other one or two cylinders contained the incendiary mixture. The propellant gas forced the incendiary through a hose and nozzle held by the operator. Some arrangement was made for igniting the fuel as it left the nozzle, such as an electrical ignitor or a pilot flame. The principal Japanese flamethrower of the war was the Type 93, which consisted of two fuel tanks and a nitrogen pressure cylinder. 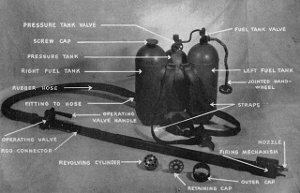 Ignition was achieved using a blank cartridge, ten of which were placed in a revolving cylinder at the nozzle end of the flamethrower. Range was 25 to 30 yards (23 to 27 m) and the 3.25 gallons of fuel could be exhausted in 10 to 12 seconds of continuous fire. The flamethrower weighed about 55 lbs (89 kg). 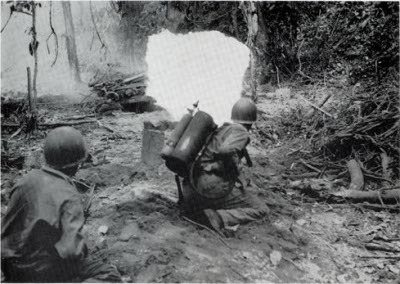 Later in the war, flamethrowers were mounted on armored vehicles that protected the operator and made it safer to approach within range of the target. Flamethrower tanks were extensively, and effectively, used at Okinawa. When even tanks proved vulnerable to antitank fire, U.S. Army troops began connecting long fire hoses to the incendiary containers in their flamethrower tanks and creeping close to the objective to douse it in fuel. The soldiers did not have to carry clumsy and vulnerable fuel cylinders and the tanks did not have to expose themselves to enemy fire. Curiously, there were reports that the Russians used flamethrower tanks as early as the battle of Nomonhan in the summer of 1939 (Goldman 2012). It is unclear whether the Russian practice influenced American armored tacticians or the western Allies developed their flamethrower tanks independently. The incendiary mixture was originally gasoline, kerosene, or some other flammable hydrocarbon. The Americans replaced this with napalm, a thick mixture of gasoline and fatty acids similar to those in soap. The thicker mixture could be shot to a longer distance and burned more effectively. Flamethrowers were effective against bunkers because they did not need to actually hit the soldiers inside. The burning fuel could be splashed against walls or ceiling to spread flames throughout the bunker, and the burning fuel rapidly consumed the oxygen within the confined space. A person hit directly by the fuel suffered a cruel if swift death, but those not hit were still forced to either evacuate the bunker or suffocate.